The When Waves Collide collection is woven in 10/2 mercerised cotton by Lunatic Fringe (available in the UK from The Handweavers Studio). I weave using a 16-shaft Louët Megado floor loom with a mechanical dobby. The weaving technique used for this collection is an interleaved network drafting technique that allows two curves to be represented within a single layer of cloth. The technique, referred to as Moiré, is described by Marian Stubenitsky in her book Weaving with Echo and Iris. The following notes give a basic idea of the technique but are not intended to be a tutorial. To get to grips with the technique you first need to understand the simpler network drafting technique used to represent a single curve, or indeed any other line. 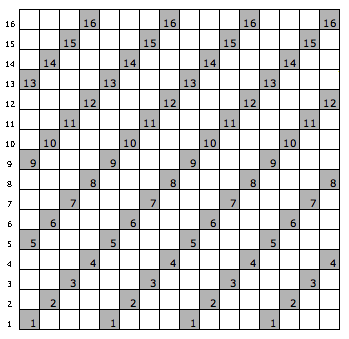 The curve is drawn onto a grid. 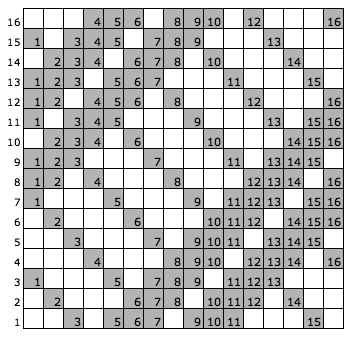 I am using 16 shafts, so I’m making life easy by using a grid sixteen squares high. Rather than using this directly as the threading sequence for the warp, the curve is then mapped onto a network. The network I am using is based on a 1/3 twill. The second curve is also mapped onto a network, but this network is offset from the previous one (this ensures that you never get two adjacent warp ends on the same shaft). Here, warp end 1 must be on shaft 3, 7, 11 or 15. The two mapped curves are then interleaved to create the threading sequence for the warp. The same sequence is used for the order of lifts during weaving, with the 16 rows of the dobby set as shown below. My intention in this project is to show some of the different possible interactions between two sine waves, so I have used the same network drafting approach throughout. There are lots of other variations to be explored, have a look at a book such as Marian Stubenitsky's and get inspired.